All quiet in the press centre – for now! Checked into the media centre at Stade D’Ornano (show jumping and dressage venue) which opened yesterday. Got issued with the Alltech media satchel with the official programme and a few other goodies. The media centre looks good, although with hardly any journalists here at the moment, it is not surprising it looks very spacious. When the 1200 journalists and photographers issued with accreditation arrive, there will be definitely be more of a squeeze. Luckily not all of them will be there at the one time (hopefully). First thing was to get the media wifi password but was told that I could only register one device on this, so as I didn’t have my laptop with me, I decided to wait to do this later, as my laptop is where I will be doing most of my work. I was a bit surprised at this, I’ve not encountered this before at other equestrian events. As I do use my mobile quite a lot to do the social media side of NZ Eventing, it’s going to mean I burn through my data usage during the competitions and while I am out and about. Hopefully it will all work ok. When covering the Olympics ten years ago, we had to use dial-up and could spend 20 plus minutes trying to connect, often without success. Great that technology keeps improving. The helpful boys from the lovely chill out area sponsored by Orange (telecommunications company) came to my rescue and said “come into our little chill out area and use our free wifi”. Great, I thought! Very comfortable couches but it seemed that their free wifi was overloaded and my connection went on and off and on and off. Not even enough to send one tweet! Bit strange really, as there was only the five or six staff and two visitors in the area. I suggested that they may have an issue when everyone arrives, and they did seem to agree, and went back to scratching their heads while all peering at a computers. Took the compulsory selfie in the press conference area before any action started. The excitement really started to flow going into this area, it won’t be long before we are seated there, eagerly waiting the first quotes from the winners of the eventing world championship! Hopefully they will have a Kiwi accent! Bags a front seat! The press conference room awaits the arrival of new champions. 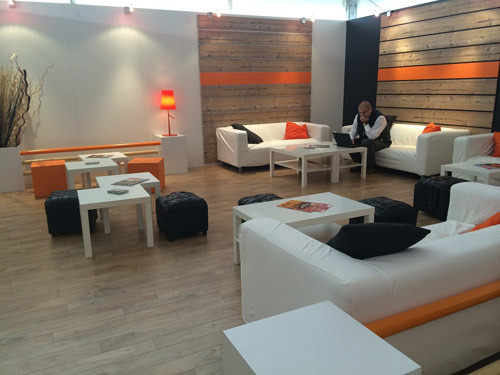 Orange’s Chill Out zone will be the place to, well, chill out. No horses in sight on the streets of Caen, but we’re pretty sure they were here.